We wanted to go somewhere new last Saturday, so off we went for a drive to the Palm with the kids. We valet at what looked like a mini version of everything else on the crescent of the Palm. There were 3 restaurants in the Entertainer, so we went to Vibe first to check it out. Their buffet lunch had just finished so we thought let’s just have a drink – it was a beautiful day (like every other day in Dubai!) and an ice-cold beer with some snacks would be great while the 2-year-old was sleeping in the pram. We asked for the drinks menu and was politely advised that this was a dry hotel. Moving on, we then went to The Social Kitchen. There was an event going on so we moved on to the last option in the Entertainer – Afternoon Tea at Chapters. The staff on duty seemed a bit surprised when I asked if we could have afternoon tea as we had not pre-booked. I was starting to get really upset. Upset because any minute now the 2-year-old was going to wake up and the idea of a peaceful afternoon will go down the drain and upset because I was getting quite thirsty, hungry and just… upset. So relieved when we were told we could do afternoon tea. Plus, we could have unlimited drinks. Non-alcoholic of course! I know my introduction was the longest and if you’re actually still reading this post, thank you very much. How was the afternoon tea? Would I recommend it? Honestly, it was much better than we had expected. Priced at 140 AED per person – which is 140 AED for 2 with the Entertainer, it was worth the money. The flyer said “vegan, paleo, gluten-free or wheat-free” snacks. For a meat-eating, cake-munching, bread-loving family, it didn’t sound very tasty at all. So in our heads we were expecting to be disappointed, which I think was a good thing because these healthy treats were so so tasty we enjoyed nearly every little piece on our tier. For drinks, you could order as many as you wish. None from the cold drinks menu except for iced tea or coffee (which is fine with us!). 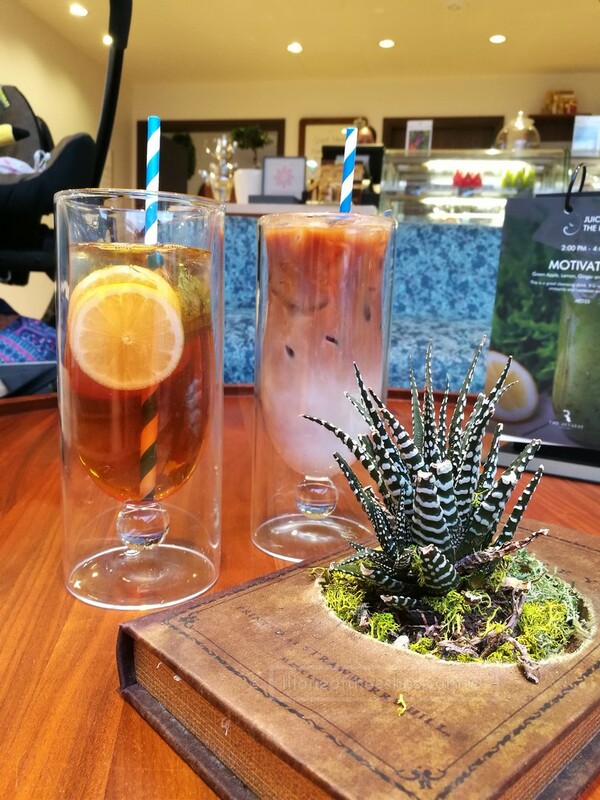 They have a really interesting hot drinks menu – you will be happy if you’re a tea person – from matcha green tea, to cumin tea to black seed tea. 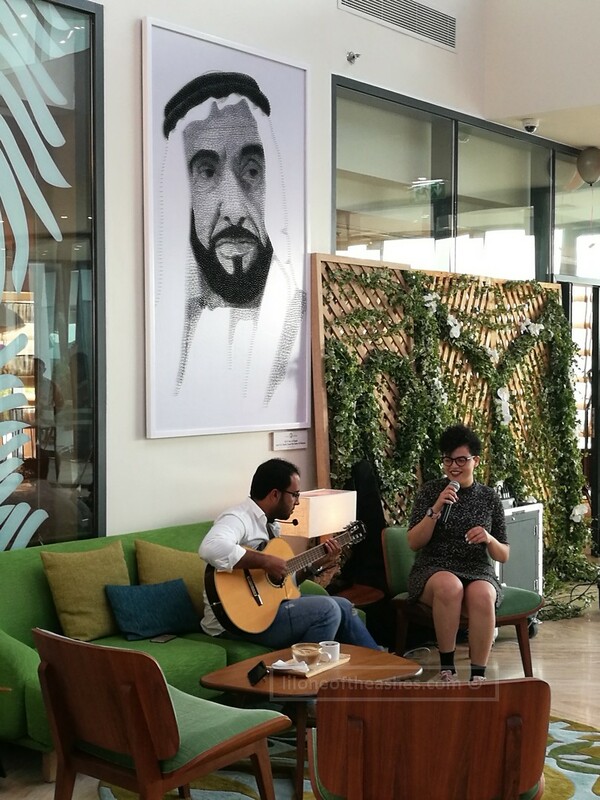 I tried their saffron cappuccino, which would be really good if you like saffron 🙂 (Ps – I have come to realise I am not really a saffron person 😉 ) They had another coffee option with camel milk which I really wanted to try, but unfortunately they didn’t have camel milk that day. Next time then. 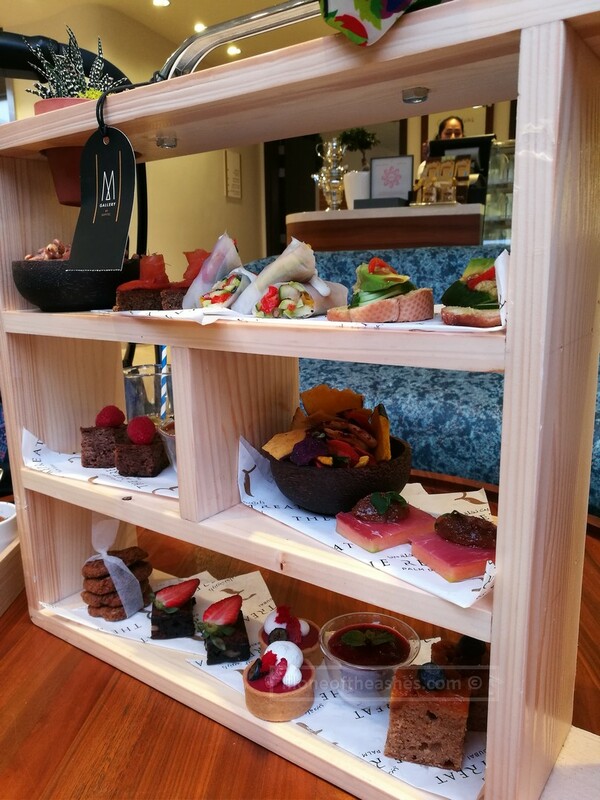 Their afternoon tea selection – a combination of healthy savouries and sweets. They had a vegan slate – combination of cucumber on tapenade spread, grilled avocado on egg-free bread. My favourite was their vegan vietnamese rice paper rolls given a kick with their spicy cashew sauce. We were a bit glad that it wasn’t an entirely vegan afternoon tea – they did have some meat – smoked salmon with sun-dried tomato and guacomole on paleo bread. Ah, and an aged beef bresoala with rock melon and figs chutney. Sounds delicious, isn’t it? It definitely was! There was also a bowl of vegetable chips which looked suspiciously like Hunter’s Vegetable Chips we order all the time, ha ha. No afternoon tea is complete without cakes. We were so full by then. The vegan banana dates walnut cake was our favourite – so moist and not too sweet. Another favourite was the coconut citrus cake. It would have been better if they had scones. The highlight of all my afternoon tea trips are scones. Could you possibly include scones to your afternoon tea?